Geology in Motion: The longest surf ride in the world! The longest surf ride in the world! Video is found by scrolling in here. Thanks to Geology.com for finding this video of surfers catching a tidal bore in Cook Inlet, Alaska. Wired magazine says that since January 13 it's had nearly 1,200,000 views! Fantastic waves at many scales. A tidal bore occurs when the normal daily tides travel up a river or narrow inlet against the direction of river flow. It is not, as commonly believed, a tsunami, and does not resemble a tsunami. I saw the famous tidal bore in the Bay of Fundy a few years ago. This bore competes with Ungava Bay for the title of the highest tides in the world. They appear to be tied at 16.8-17 m! During the 12.4 hour tidal period, 115 billion tonnes of water flow in and out of the bay. The size of the waves depends on the strength of the tides and while the one I saw was only a few inches high, the amount of water pouring into the Bay, and its inexorable march upstream, was phenomenal! Well worth the journey to get there. 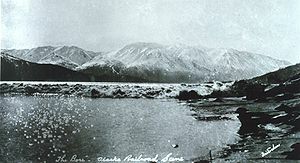 Tidal bore in Cook Inlet. Photo from NOAA. Tidal bores range in shape from the beautiful undular form see in the picture above to a breaking wave; the picture to the right shows a stronger tidal bore in Cook Inlet. 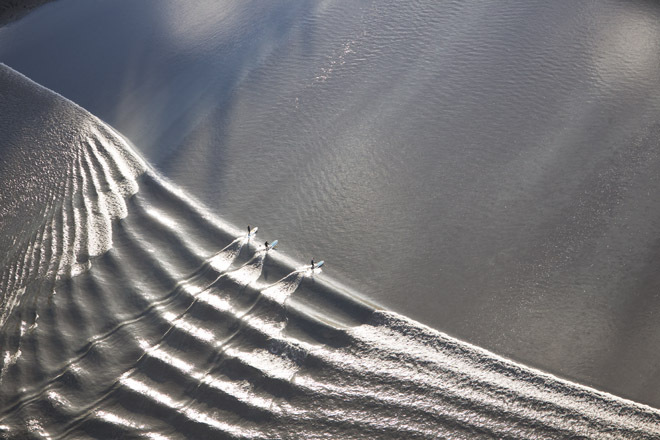 Surfing on these waves, known as river surfing, has become a popular sport. I spelled it as tonnes, the metric unit for 1000 kilograms, which was given in the original article.